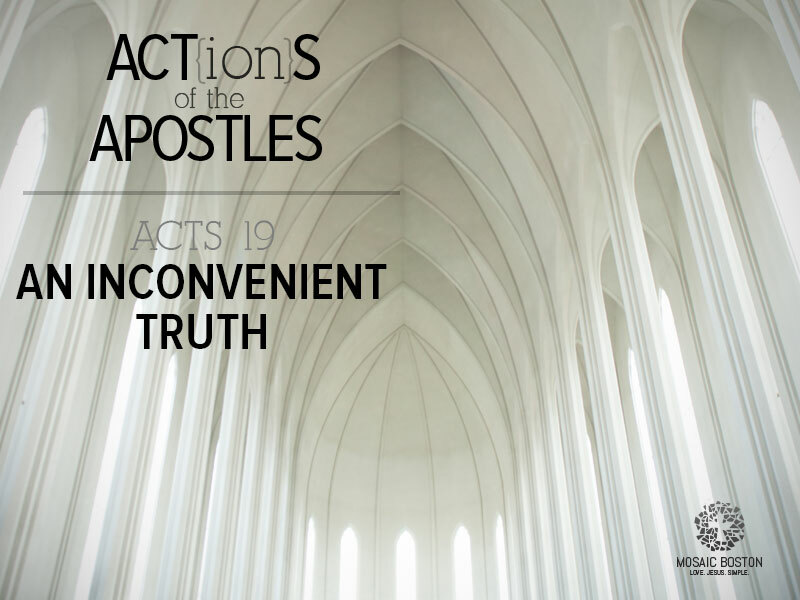 Dear Mosaic Family,Tomorrow, we'll be studying Acts 19, where the Apostle Paul preaches the Gospel in Ephesus and calls people to worship Jesus instead of false idols. Instead of debating the cogency of Paul's arguments, the people realize that if they follow Jesus, they will lose their jobs making idols and will no longer profit from tourism to the pagan temples in their city. They realize that if they follow Jesus, they will have to make a huge sacrifice. However, they don't want to make a sacrifice, so instead, they reject Jesus. (1) If claim C is true, X is the case. (2) I find X difficult, inconvenient, repulsive, or undesirable in some other way. (3) (So) claim C is false. (4) If I find X difficult, inconvenient, repulsive, or undesirable in some other way, X is not the case. This faulty logic is one of the main reasons why people reject Christianity. Tomorrow, we'll talk about the irrationality of pretending truths do not exist, or don't apply to you, simply because you don't like them. Membership Class. Saturday March, 15th 9am-Noon ICC 30 Gordon St. Allston Are you ready to take the next step and become a member of Mosaic Boston? Would you just like to learn more about who we are and what we value? If so, please join us for our next membership class. Members' Meeting. We had an awesome membership meeting today, and welcomed in 10 new members! Praise Jesus!! Baptism Service. February 9th [TOMORROW]. If you're interested in getting baptized at Mosaic, please email pastor Jan: jan@mosaicboston.com. Pray for our team headed to Sochi! Kevin Chan, Josh and Lise White, Joel Klein, Emmanuel Wong, and I are headed to Sochi to work with a ministry there during the Olympics. We're leaving next Sunday. Please pray for us! Old Testament Seminar. Saturday, February 22nd. 10am-noon. ICC. 30 Gordon St. Allston. Would you like to gain a better grasp on the Old Testament? Ryan Lind from Gordon-Conwell Theological Seminary will be hosting a one time seminar exploring the major events and themes of the God's redemptive work in the Old Testament. Older PostDo not be Silent!